Every morning when I turn on my computer and browse through my news feeds I am inundated with stories about data management, big data and data preservation. It is clear that these issues are a hot topic in information management, and that librarians need to start paying attention. Because librarians are at the hub of where research and development activities take place (hospitals, academia, private institutions), we have the ability and opportunity to stake a claim in the management of our patrons’ data creation. I’ve already discussed data curation in a previous post, but today I want to introduce some very basic principles of archival theory. These basic principles will help medical librarians (and anyone else involved in information management) understand the importance of trustworthiness, and how it can be applied to data management. In the simplest terms, for a record or element of data to be considered trustworthy it must be reliable, authentic and accurate. If data or a record is missing one of these components, it cannot be trusted. The reliability of a record/data element as a statement of fact. Reliability exists when a record can stand for the fact it is about (ex. why was it created? ), and is established by paying close attention to the completeness of a record/data element’s form and how much control was present at the process of its creation. The characteristic of a record/data element that refers to the presence of all the elements required by the creator for it to be capable of generating consequences (ex. it serves a purpose and can be used to enact this purpose). Completeness also means that it (the record/data element) is the first (it is not derived from something else) and is effective in the sense that it is capable of carrying out the consequences of what the creator intended it to do. These two facets of completeness comprise what can be defined as an original record/data element. The process of creation is simply the procedure taken that governs the formation of a record/data element and the participation of the act of creating a record. This phase is very important as the process of creation is an indicator of whether the record will be complete and reliable. 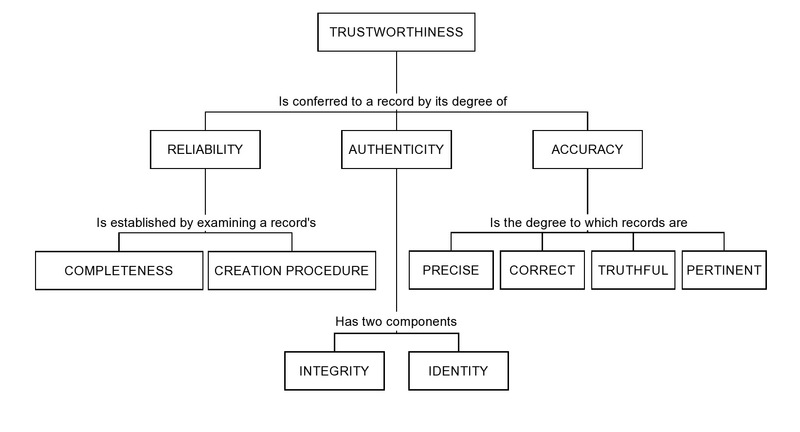 Authenticity represents the trustworthiness of a record as a record.What this means is that the quality of a record represents what it purports to be and that it has not been tampered with or corrupted. Authenticity is made up of two different components: integrity and identity. Integrity refers to the quality of the record/data element of being complete and unaltered in any essential way. If a record/data element is altered or missing something it can no longer be considered authentic, and therefore is no longer trustworthy. Identity represents all the characteristics of a record/data element that uniquely identify it and distinguish it from any other record/data element. Accuracy of a record/data element is present when they are precise, correct, truthful, free of error or distortion, or pertinent to the matter. To clarify pertinence, archival diplomatic theory defines a record/data element to be pertinent if its content is relevant to the purpose for which it is created and/or used. For a record/data element to be accurate all four of these components must be present. This post only scratches the surface of one small aspect of archival theory. The facets of trustworthiness I have addressed here were originally developed to address the issues surrounding paper records. However, these principles are ubiquitous in the sense that they can be applied to the new issues surrounding the creation, management and preservation of data. Maintaining data trustworthiness is essential for medical researchers, especially when original data is required to provide evidence of their findings. I believe medical librarians have a duty to understand these principles in order to better serve their patron base as the presence of data in medical research continues to grow. With a solid grounding in archival theory, medical librarians can apply this new knowledge to the expertise they already have managing medical information. This combination of skills will help create a smooth transition for librarians as we venture (and stake a claim!) in the new world of managing medical research data. Duranti, Luciana (1998). Diplomatics: new uses for an old science. Society of American Archivists and Association of Canadian Archivists: Scarecrow Press. Interpares 2 Project: International Research on Permanent Authentic Records in Electronic Systems. Retrieved from: http://www.interpares.org/ip2/ip2_terminology_db.cfm on August 20, 2012. Although I am no longer a student, I thought this blog would be a great opportunity to share my experiences of being mentored throughout library school. I’ll discuss briefly my experiences as someone who is mentored and then provide a list of traits students should look for in a mentor. I can honestly say that I don’t think I would be where I am today in the field of librarianship without my mentors. Having the opportunity to seek direction and guidance from experienced librarians was potentially the most valuable thing I gained from library school. What I enjoyed most about the experience was that I was constantly pushed to be a better librarian and achieve more; asked to critically analyze my work on every level imaginable; and given the opportunity to share my concerns and anxieties about the profession openly in a safe environment. With the privilege of having three mentors during my MLIS, each provided me with a different perspective on the world of librarianship — and this was a good thing. Even though having multiple perspectives may sometimes bring about conflicting ideas about your approach to the profession, I believe that these perspectives are important to hear so that you can evaluate them and make your own decisions. This ability to form your own conclusions is a major component of what mentorship is all about. Mentors can only guide you for so long until you need to start deciding how you want to work and where your interest lie. Mentorship should also be reciprocal, where each party is learning from one another. I found that the best interactions I had with my mentors came when we were having an in depth discussion about library issues, sharing our views and listening to one another. This type of relationship is healthy and can often foster some great ideas for presentations or papers! TRUSTING – It is absolutely imperative that you trust your mentor and their advice. A mentor should be someone you can approach with any issue you have an feel comfortable doing so. If a mentor makes you feel like you are wasting your time or that your concerns are unimportant, then you should most likely move on. ENCOURAGING – This may be a matter of preference, but I am always interested in learning new things and enjoyed being introduced to new ideas and ways I can contribute to the field. A mentor should be willing to introduce these new areas and encourage you a little into trying them as well as let you know when you get complacent or lose direction. I would argue that it is a good thing to be pushed sometimes so that you are removed from your comfort zone and thrust into a new area of the field. GOOD LISTENER – Being a mentee in library school can be a form of selfish exercise sometimes, where you have lots of questions and want them all answered. Mentors are excellent resources in this case. Being a student or even a professional at any time requires a certain curiosity; my mentors always encouraged me to ask questions from day one and I took their advice. They were always very patient with me and were willing to answer anything I threw at them. In another vein, stress may often come into play where you need to vent about something. My mentors were wonderful in that they took the time to listen to my problems and were always keen to offer advice. This is a sign of a great mentor. OPEN COMMUNICATOR – My mentors always encouraged open communication and I think that this is a trait that is absolutely essential. Being able to communicate in an environment where you both feel comfortable voicing your own opinions (even if you do not agree) is really a wonderful thing. I never once felt awkward or uncomfortable disagreeing with a particular idea or topic my mentor suggested. To have a healthy and supportive relationship, you need to be able to discuss your ideas openly. SUPPORTIVE – Another very important trait in a mentor is that you should always feel supported by them. If a mentor ever belittles or demeans your ideas or goals then they are most likely not the right mentor for you, or anyone for that matter. A mentor should push you and have you strive to produce high quality work, but they should never EVER make you feel stupid or inadequate. Support aligns itself with trust, and therefore when considering someone as a mentor you must feel comfortable knowing that they will support your decisions and ideas and encourage you to excel in those areas. BE ABLE TO HANDLE CRITICISM (CONSTRUCTIVE OF COURSE) – One of the most important aspects of mentorship is that you must be able to handle a little constructive criticism once in a while. We aren’t perfect, and a good mentor should be able to correct you or provide suggestions on how you can improve certain skills whether it be giving presentations, writing papers, cataloguing, etc.. I strongly believe that egos need to be checked at the door in these relationships in order for you and your mentor to gain something from it. BE WILLING TO COLLABORATE AND PARTICIPATE – I was fortunate enough to have my mentors approach me with ideas on writing papers or giving presentations. My advice would be to say YES! to almost anything they throw at you. Having an opportunity to write a scholarly paper or give a presentation with library professionals is invaluable experience, so say yes and do your best to help. ASK FOR PROJECTS – I believe that one thing a mentor loves to see is that you have an interest in learning new things and want to try to apply these interests practically. Even if it is something as simple as reading a few good articles on the side and summarizing them, any project that you can acquire from your mentor will be great experience. There was never a time where I went without a project of some kind, as my goal was to gain as much experience as possible. GIVE BACK – As I mentioned earlier, mentorship should be reciprocal where you give back to your mentor as much as they give to you. I would like to think that there are areas where I provided useful information to my mentors that they previously didn’t know about. Having the ability to share information with each other where you both are learning new skills and topics can be a wonderful thing. BE OPEN – Make sure that you are open with your mentor. They are taking time out of their busy schedule to provide you with advice and guidance, so the least that you can do is show them the respect of voicing your opinions and your ideas. If something is bothering you about an interaction you had, speak up and address it so that you can come to a conclusion. Similarly, if you are working on a project that you are not particularly enjoying let them know. The last think either of you wants is to be wasting each other’s time. Mentorships can be so valuable if you and your mentor establish a good relationship early on. I know that I benefited greatly from my mentors and that I am a better librarian because of it. I hope this post will encourage young library students to consider a mentoring relationship with a professional and ultimately prepare them to commit and invest in their own professional development. As someone who has benefited greatly from my mentors, it is my goal to give back and lend my own experience and guidance to keen emerging librarians in the future. The importance of user engagement — how embedded are you? The early results from Freiburg and Kramer’s article indicated that the librarian was not only providing more hands on training in courses and through library workshops, but also sitting in on faculty committee meetings and contributing to grant development teams. This type of role is something I find really exciting because it takes the librarian out of their traditional role and places them in the middle of their patron base, where they are more visible. Another article by Schulte (2011) confirms in a case study from the Ohio State Health Sciences Library that developing more proactive reference services provides opportunities creates more specialized reference transactions. This result demonstrate that being more hands on with our patrons allows us to provide more individualized service to a specific patron base. Embedded librarianship is so appealing to me because it places the librarian in an environment where they can be of use to their patrons. Too often I have seen librarians sitting in their office at the back of the library where nobody can see them. Becoming more accessible to our users and demonstrating that we are excited and qualified to help them in their own environments will provide us with a new role. My concern is that I do not see enough case studies published about their embedded librarianship efforts. I plan to conduct my own research on this topic in the future and in the mean time, hope that more studies emerge so that best practices can be developed. Being a librarian who loves to engage with his users, I love the idea of being hands on and available to patrons at every opportunity. The Embedded Librarian blog has been an incredibly valuable resource for me in terms of learning about the various components of this new role. The bibliography they developed has a wealth of information on the topic. To conclude I would like to ask a question: Out of curiosity, how embedded are other librarians out there? What measures have you put in place to try and become more engaged with your users? I would love to know! Kealey S.(2011). Continual evolution: the experience over three semesters of a librarian embedded in an online evidence-based medicine course for physician assistant students. Medical Reference Services Quarterly, 30(4), 411-25.